This is a scalable context timeline. It contains events related to the event Mid-September-Late 2001: Imam to 9/11 Hijackers’ Hamburg Cell Is Investigated but Allowed to Leave Germany. You can narrow or broaden the context of this timeline by adjusting the zoom level. The lower the scale, the more relevant the items on average will be, while the higher the scale, the less relevant the items, on average, will be. Jamal Zougam. [Source: El Mundo]By 2000, a Moroccan living in Spain named Jamal Zougam begins to attract the attention of Spanish intelligence. Barakat Yarkas frequently travels to London to meet with al-Qaeda-linked imam Abu Qatada, and Zougam accompanies Yarkas on at least one of these trips (see 1995-February 2001). Spanish intelligence is monitoring Yarkas and his cell, and they are aware that Zougam is introduced to Qatada as “a gifted young recruit.” [Agence France-Presse, 3/17/2004; Irujo, 2005, pp. 77-79] In June 2001, a French investigator warns that Zougam is an important militant with international links and advise the Spanish to arrest him (see June 2001). Around the same time, Spanish investigators learn that Zougam met with Mohammed Fazazi, a Moroccan imam who preached at the Al-Quds mosque in Hamburg, Germany, that is attended by some of the 9/11 hijackers (see 1993-Late 2001). On August 14, 2001, Zougam is recorded telling Yarkas that he had offered Fazazi money for the jihad cause. Fazazi is also linked to Abu Qatada and had met him in London. 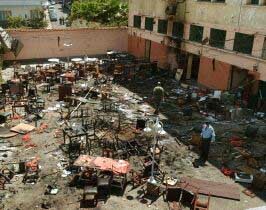 After the May 2003 Casablanca bombings (see May 16, 2003), interest in Zougam increases as the Moroccan, Spanish, and French governments all suspect he was involved in those bombings. But he is still not arrested, and his surveillance in Spain is not increased, apparently due to lack of resources. [New York Times, 3/17/2004; Observer, 3/21/2004] In the days before the March 2004 Madrid train bombings (see 7:37-7:42 a.m., March 11, 2004), Zougam makes about a dozen phone calls to contacts in London. He is said to talk to four al-Qaeda suspects, as well as a “radical London-based preacher” - a possible reference to Abu Qatada. Zougam will later be sentenced to life in prison for playing a direct role in the Madrid bombings. [Daily Mail, 11/1/2007] After the Madrid bombings, British authorities will say that there was a “definite link” to Britain in the bomb plot. Zougam is believed to have made trips to London in search of funding, planning, and logistical help, and supplying equipment and false identification papers for the bombers. [Independent, 3/19/2004] One figure believed central to the bomb plot, Moutaz Almallah, will be arrested in London in 2005 and extradited to Spain in 2007 (see May 16, 2005). Mahmoud Es Sayed, a close associate of al-Qaeda second in command Ayman al-Zawahiri (see Before Spring 2000). He had recently been sent by al-Zawahiri to revise the militant network in northern Italy (see Summer 2000). Abdulsalam Ali Abdulrahman, a section chief with Yemen’s Political Security Organization (PSO—roughly equivalent to the FBI). Es Sayed and Abdulrahman are overheard discussing an attack using aircraft on their way to the summit, indicating they have foreknowledge of 9/11 (see August 12, 2000). The two of them will be recorded a few months later discussing trying to get some of their associates into the US (see February 2001). In 2002, Abdulrahman will be arrested and sent to the US-run prison in Guantanamo, Cuba (see September 2002). Ayub Usama Saddiq Ali, an Islamic Jihad leader and another close associate of al-Zawahiri’s. Ali was convicted of murder in Egypt but fled to Germany and was granted political asylum there in 1999. Future 9/11 hijacker Ziad Jarrah called him once in 1999 and will call him again in August 2001 (see November 7, 1999 and August 4, 2001). Possible Informants - Berraj is an informant for Spanish intelligence, regularly meeting with intelligence agents in 2003. It is unknown when he begins informing (see Shortly Before March 11, 2004). Haddad will not be arrested in Morocco after the 2004 train bombings despite strong evidence he was directly involved, leading to suspicions that he has been a government informant (see Shortly After March 18, 2004). El-Azizi also will be suspected of being a government informant because he is tipped off by Spanish intelligence about a police raid (see Shortly After November 21, 2001). He is also arrested in Turkey for passport forgery at one point, and then let go, although it is not clear when. [Wall Street Journal, 3/19/2004] Turkish intelligence is aware of extremists’ use of Turkey as a base (see 1996), but it is unclear whether this is related to the arrest of the three men. El-Azizi will repeatedly evade arrest in Spain after 9/11, apparently with the help of Spanish intelligence (see October 2001 and Shortly After November 21, 2001). Mohammed Fazazi, the imam at the Al-Quds mosque in Hamburg, Germany, attended by three of the future 9/11 hijackers, gives an extremely militant sermon that is recorded on video. In the sermon given at Al-Quds, he says, “You have not understood the words of God or the Koran if you believe that the nonbelievers want to do good.” He advocates killing all non-Muslims “no matter if it’s a man, a woman, or a child.” He laments the difficulty of doing this not for the victims or the number of people who must die, but for the hardship it places on the killers. The video of this sermon will later be seen by Los Angeles Times reporters. [Los Angeles Times, 7/6/2005] The three 9/11 hijackers who lived in Hamburg—Mohamed Atta, Marwan Alshehhi, and Ziad Jarrah—are in the US by the time Fazazi makes these comments, although most of the al-Qaeda Hamburg cell members such as Ramzi bin al-Shibh are still in Hamburg. But the hijackers attended Fazazi’s sermons for years prior to leaving Germany (see 1993-Late 2001 and Early 1996). They also frequently had private meetings with him (see Early 1996). Fazazi will leave Germany in late 2001 (see Mid-September-Late 2001) and will later be convicted of a role in the 2003 bombings in Casablanca, Morocco (see May 16, 2003). European operatives connected to al-Qaeda appear to be making preparations for a summit between lead hijacker Mohamed Atta and associate Ramzi bin al-Shibh in Spain to finalize the details of the 9/11 plot (see July 8-19, 2001). As these European operatives are known to Spanish authorities, the preparations are monitored. For example, a conversation between operatives Barakat Yarkas and Amer el-Azizi is overheard. However, Spanish authorities do not pass this information on to their German counterparts. [Wall Street Journal, 3/19/2004; Vanity Fair, 11/2004] El-Azizi is also overheard talking to an Algerian, possibly Mohammed Belfatmi, based in Tarragona, where Atta stays for part of the time he is in Spain. [Los Angeles Times, 4/29/2004] In one recorded conversation between Yarkas and another militant, Yarkas says that “Amer”—presumably a reference to Amer al-Azizi—is handling the arrangements for a meeting. [Los Angeles Times, 4/14/2004] Police will later find el-Azizi’s address book; it contains the names of three contacts in the small town of Reus, where bin al-Shibh landed when he flew in from Germany. [Wall Street Journal, 4/7/2004] These European operatives hold a parallel meeting elsewhere in Spain (see July 6, 2001 and Shortly After) and some may also meet with Atta and bin al-Shibh (see July 8-19, 2001). El-Azizi’s arrest will be frustrated by Spanish intelligence after 9/11 (see October 2001 and Shortly After November 21, 2001) and he will go on to be involved in the 2004 Madrid bombings (see Before March 11, 2004 and 7:37-7:42 a.m., March 11, 2004). Mohammed Fazazi. [Source: Luis de Vega]German intelligence investigates Mohammed Fazazi, the imam at the Al-Quds mosque attended by most members of the al-Qaeda Hamburg cell, including three of the 9/11 hijackers (see 1993-Late 2001 and Early 1996). Fazazi is monitored, and he is seen meeting with an unnamed hijacker associate. However, no charges are brought against him and he leaves Germany for the last time in late 2001. Fazazi is a Moroccan citizen, his wife and children live in Morocco, and in recent years he has been preaching on and off at a mosque in Morocco at the same time he preached at Al-Quds in Hamburg, so he goes to Morocco and stays there. He will later be convicted for a role in the 2003 bombings in Casablanca, Morocco (see May 16, 2003). Abdelkader Farssaoui, a.k.a. Cartagena, is the imam of a mosque in the town of Villaverde, near Madrid, Spain. In 2007, he will testify under oath as a protected witness that he was recruited to be a police informer beginning in late 2001, if not earlier. He says that he is also working as an informant for the government of Morocco, but he nonetheless becomes highly trusted for the Spanish. Apparently, he is little used by the Spanish until about September 2002. But starting that month, he informs on a group of men attending his mosque, led by Serhane Abdelmajid Fakhet. Other members in the group he watches include Said Berraj, Mustafa Maymouni (Fakhet’s brother-in-law), Mohammed Larbi ben Sellam, and Rabei Osman Sayed Ahmed. He is also encouraged to bring Jamal Zougam closer to the group, although he does not see Zougam doing anything criminal. All of these men will later have alleged roles in the 2004 Madrid train bombings (see 7:37-7:42 a.m., March 11, 2004), except for Maymouni, who will be arrested in Morocco in 2003 for a key role in the Casablanca bombings there that year (see May 16, 2003). Even before Maymouni was arrested, Farssaoui has been giving warnings to his handlers that the group is talking about conducting attacks in Spain and Morocco (see April-June 2003). He is able to get the mobile phone numbers of all of the men so police can monitor those phones. Police do monitor the group members in other ways to confirm what Farssaoui is learning (see January 17, 2003-Late March 2004). In October 2003, Farssaoui reports that Fakhet is “looking for martyrs.” But Farssaoui is told by his handlers to immediately leave Madrid for another assignment (see October 2003). He does, so he stops monitoring the bombers just as they began planning their bombing in detail. He later says that his handlers forbid him to share what he learns with judge Baltasar Garzon, who is leading investigations into al-Qaeda related cases in Spain. They also encourage him to exaggerate what the suspects are doing so they can be indicted, and he does. This testimony Farssaoui will give in 2007 will contradict some details of earlier testimony he gave in the same trial, but he will claim that it took him time to find courage to tell the whole truth. [El Mundo (Madrid), 10/18/2004; El Mundo (Madrid), 10/21/2004; El Mundo (Madrid), 3/7/2007; ABC (Spain), 3/7/2007] He will also claim that he later accidentally discovers Farket, the leader of the group he was watching, is also a government informant (see Shortly After October 2003). She says that militants regularly met at her apartment. She and her husband have just moved, and militant continue to meet at their new apartment on Virgen del Coro street in Madrid. She says that her husband lived with Serhane Abdelmajid Fakhet for a month in December 2002. Mustapha Maymouni, Fakhet’s brother-in-law, visited as well. They moved when they felt they were suspected by police. She saw her husband open several boxes and noticed they contained books and videos about Osama bin Laden. Her husband and his brother, Moutaz Almallah, strongly suspect their phones are being monitored. Moutaz lives in London but frequently visits Spain (see August 2002). Sometimes her husband Mouhannad and Fakhet discuss Amer el-Azizi, who fled a police raid in November 2001 (see Shortly After November 21, 2001). She finds out they helped him escape Spain dressed as a woman. El-Azizi is believed to be linked to the 9/11 attacks (see Before July 8, 2001). Both Mouhannad and Fakhet remain in contact with el-Azizi by e-mail. Her husband’s brother Moutaz does as well. Police apparently take her warnings seriously because they begin monitoring her apartment in March 2003 (see January 17, 2003-Late March 2004). Most of these people—Fakhet, el-Azizi, Ghalyoun, and both Almallah brothers—are already under surveillance (see December 2001-June 2002). [El Mundo (Madrid), 7/28/2005] All of the people she mentions are believed to have important roles in the 2004 Madrid bombings (see 7:37-7:42 a.m., March 11, 2004), except for Maymouni, who will be arrested and jailed later in 2003 for having a pivotal role in the May 2003 Casablanca bombings (see May 16, 2003). Spanish judge Baltasar Garzon renews permission to wiretap the phones of Serhane Abdelmajid Fakhet, considered to be one of about three masterminds of the Madrid train bombings (see 7:37-7:42 a.m., March 11, 2004) that will occur one month later. Interestingly, in the application for renewal, Fakhet is linked to the Casablanca bombings of May 2003 (see May 16, 2003). His brother-in-law Mustapha Maymouni was arrested in Morocco and is being imprisoned there for a role in the bombings at this time (see Late May-June 19, 2003). Fakhet is also linked in the application to Zouhaier ben Mohamed Nagaaoui, a Tunisian believed to be on the Spanish island of Ibiza and preparing for a suicide attack on a ship, following instructions from al-Qaeda. Nagaaoui is also said to be linked to the Casablanca bombings. Further, he has links to a number of Islamist militant groups and had undergone weapons and explosives training. [El Mundo (Madrid), 7/30/2005] Around the same time, Garzon also renews the wiretapping of some other Madrid bombers such as Jamal Zougam. [El Mundo (Madrid), 9/28/2004] It is not known what later becomes of Nagaaoui. Amer el-Azizi, a leading al-Qaeda operative, is thought to re-enter Spain to activate a cell that carries out train bombings in Madrid in 2004 (see 7:37-7:42 a.m., March 11, 2004), as he is seen by witnesses in Madrid after the attacks. [Los Angeles Times, 4/29/2004] A senior Spanish investigator will say in 2004, “There are people who have seen el-Azizi here in Spain after the attacks. It looks like he came back and may have directed the others. If he was here, his background would make it likely that he was the top guy. We have reliable witness accounts that he was here in significant places connected to the plot. The idea of el-Azizi as a leader has become more solid.” [Los Angeles Times, 4/14/2004] His fingerprints are found in a safe house first used by the bombers in 2002. A Spanish investigator will comment, “El-Azizi was the brains, he was the link between the [bombers and the rest of al-Qaeda.” [Irujo, 2005, pp. 218; Vidino, 2006, pp. 320-321] El-Azizi was arrested in Turkey in 2000 with several of the 2004 Madrid bombers, but they were released for an unspecified reason (see October 10, 2000). Spanish intelligence also frustrated his arrest after 9/11 (see Shortly After November 21, 2001). The Al-Quds mosque, which was attended by three 9/11 hijackers for several years (see Early 1996), is closed down. The mosque in Hamburg, Germany, has long been known as a gathering place for radical Islamists. In recent years, it changed its name to the Taiba mosque. Police raid the mosque and shut it down, ban the cultural society linked to it, and confiscate its assets and documents. However, there are no arrests. There was a long legal battle before the police were given permission to close the mosque. Der Spiegel comments: “Every Muslim visitor must have known that he was under close scrutiny from police authorities as soon as he set foot in the building. 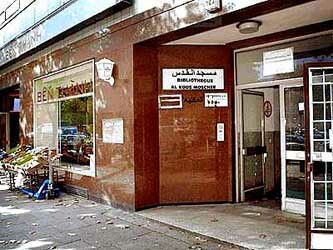 In fact, it proved quite helpful for the Hamburg intelligence service because all the city’s Islamists would congregate here.” However, not only was the mosque associated with the 9/11 attacks, but the imam at the mosque for most of the 1990s, Mohammed Fazazi, was convicted of involvement in the 2003 bombings in Casablanca, Morocco (see 1993-Late 2001 and May 16, 2003). Furthermore, in 2009, a group of 10 radical Islamists who had attended the mosque left Hamburg for Pakistan’s tribal region in an attempt to attend militant training camps (see March 5, 2009). Some were arrested and revealed they were part of a plot to attack targets in Europe, and they also linked up with members of the al-Qaeda Hamburg cell (see May 2010). One of them, Naamen Meziche, who will be killed in a US drone strike in 2010, is the son-in-law of Fazazi, the former imam at the mosque (see October 5, 2010). 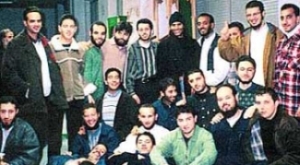 In recent years, the imam at the mosque has been Mamoun Darkazanli, who was linked to many in the al-Qaeda cell with the 9/11 hijackers, and was suspected of belonging to al-Qaeda well before 9/11 (see Late 1998 and October 9, 1999). Spain has filed a request for his extradition on terrorism charges, but Germany has refused to extradite him (see (see Late April 2007). [Der Spiegel (Hamburg), 8/9/2010] Some German officials believe he is still involved in al-Qaeda, but he apparently is careful not to break any German laws (see November 11, 2010).